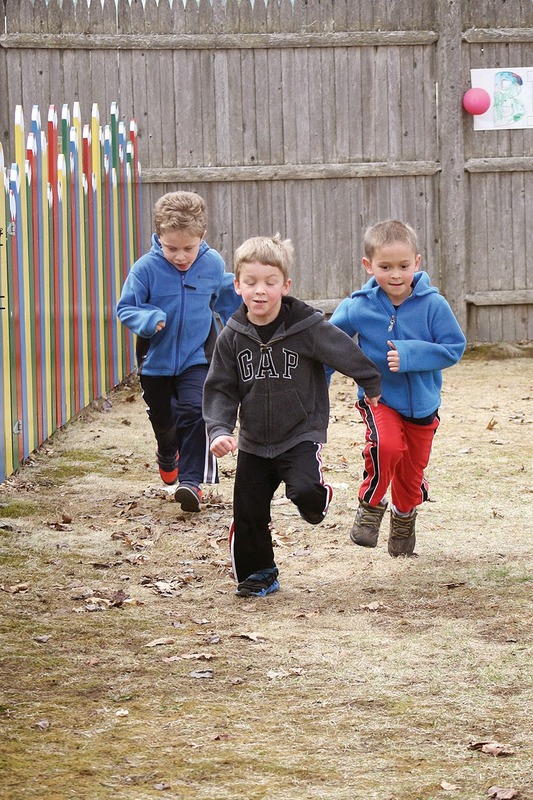 Birchwood Day Nursery offered children the chance to run a “marathon” of their own after learning about the big race in Boston. 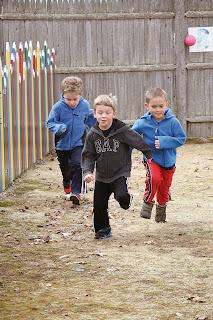 Last week, children from the school ran to raise money to help ensure that children in Windham don’t go hungry. Families raised enough money to sponsor fourteen children for a school year through the RSU14 Backpack program. This year marks the fifth Birchwood Marathon, said Heather Marden, a teacher at the school. Since the beginning, the teachers have tied this run in with the Boston Marathon, teaching children the history of that race, talking about the many types of people who run, and studying marathon maps. There is also an emphasis on health and fitness throughout the study. Last year, the loss of the niece of one of the teachers inspired the school to begin raising money for a cause. 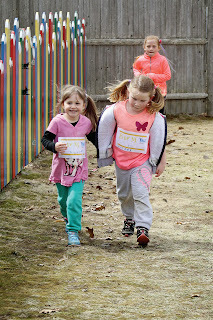 “One of the things we try to teach the kids is the social aspects [of the Boston Marathon],” said Marden. The children learned how many people run in Boston to raise money for a specific cause. While researching options on where to donate the money this year, Marden found the backpack program, which provides supplemental food to children every Friday to ensure that they aren’t going hungry over the weekend. Learning that just $200 could sponsor a child for a school year, she knew she’d found the right program to support. “One thing I wanted to do was make sure it reached children somehow,” said Marden, and $200 per child sponsorship was a realistic goal, she said. Children are beaming with pride when they bring their pledge sheets to school, she added. “It’s nice to see them realize they are helping kids,” said Marden. The challenge that children have been training for is to run four laps around the front lawn of Birchwood Day Nursery without stopping. Like any marathon runner, the children have trained for the event. Marden said she teaches the children that most people run Boston not to win, but to finish. During the run, there is great camaraderie among children, she said. If someone falls, many children stop to offer the child a hand. This event is teaching children not just about being healthy physically, but also encouraging vital social and emotional development in the children, Marden said. As only a high school junior, before last week I had very little experience with international travel. So it was to be expected that eight hour overseas flights, jet lag, and being an ocean away from home was a concept as foreign as the county I was going to. Having only briefly crossed the Northern Maine border into Canada as a prerequisite, the idea of spending my April vacation touring France was equally daunting and thrilling to an adventurous person like myself. Naturally, I jumped at the chance when it arose. Luckily for me, my first real globetrotting experience through EF Tours and hosted by Windham High School turned out to be perfect combination of learning the ropes of foreign travel while still having the comfort of teachers and week-long tour guides to lead the way. 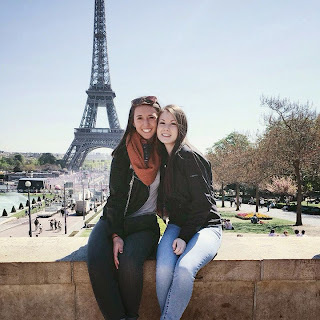 My group of 15 students consisting of mainly students in or having previously taken French class in school (yet the trip remained open to everybody), was organized by group leaders and Windham High School French teachers Erica Brown and Katie Dresnok. Their international travel, living, and previous EF tour experience made the trip go as smoothly as any newer traveler such as myself could have possibly hoped for. The parent and grandparent chaperones on the trip were also a great addition to the trip and they made us feel a little more at home even when we were 3,000 miles from it. The other students and I quickly bonded after the first 30-plus hour long travel day, and went on to go through so many new and once-in-a-lifetime experiences together as new friends. After a compact first day of busses, airports, planes and more busses, our personal EF Tour Guide named Sebastian met us in Paris. He was entertaining, friendly, and informative throughout the eleven days of our stay in France. Sebastian worked hard to ensure all logistics, including transportation, sightseeing tickets and guided tours, and hotels were ready for us: Essentially taking care of the most stressful part of travel. Our bus rides to and from our destinations were narrated by Sebastian, who provided us with not only historical information but also shared anecdotes about the culture and customs to help us better assimilate into the country to get the fullest effect. We were joined by another group of high school students from Massachusetts and together we embarked on the tour EF calls "Paris and The Chateaux"- but the name underwhelms the true nature of the trip. We traveled from Paris to the Loire Valley, to Normandy, and to the French Riviera, even making a stop in Monaco. In addition to hitting all the must-sees such as the Eiffel Tower, the Louvre Museum, the Notre Dame Cathedral, the Arc de Triumph, the Gardens of Versailles, we toured and explored cities, castles and cathedrals I had never even heard of, but am sure to never forget. Seeing the dwellings of so many members of French royalty, and being told their backstories made me understand why they rightfully ended up in history books. My fellow students and I put our most recent history lessons to use and discussed the events of World War II while in Normandy- thankful to have an understanding of the sacrifices we were looking at while visiting the D-Day beaches, American Cemetery, and the Caen Memorial Museum. In addition to historical and typical tourist stops, our trip gave us outlets to experience French culture, such as touring factories where two of France’s most notable exports are made, wine and perfume. Our bus driver was even willing to stop on the side of the road for a photo-op with one of the many fields of signature yellow canola flowers scattering nearly every field, viewed from nearly every highway, from Paris to Nice. While the breathtaking scenery and influx of new information about France's past, one of my favorite parts was experiencing the country's present. Given the information needed from our tour guide and group leaders, we were trusted to venture off and explore by ourselves. This allowed time for browsing both souvenir shops and designer boutiques along the Champs-Elysees in Paris. We tried espresso for the first time at a street-side café, all on our own accord. The free time we were given let us make the most of our own personal experiences and be the independent travelers we aimed to be by going on this trip. Even plagued by my rocky French, I learned the important lesson that a simple "s'il vous plait" and "merci" can get you far in France, but knowing I could do it on my own gave me the cultural immersion that truly made the trip. Through the guidance of my teachers, tour guides and EF, my debut travel abroad experience was unforgettable and awe-inspiring, and gave me the experience and confidence to become the traveler I wish to become. Everything from navigating public transportation to foreign etiquette will make me a better traveler in the future. While this may be my first and last EF tour, it was a trip of a lifetime. I strongly encourage all young and wanderlust-stricken travelers to take the opportunities offered through the high school. Happy travels, or should I say, bon voyage! I’m going to start out by saying that I’ve been graced with everything “right”... I was born a male to a white, middle-class, married couple that stayed together until death. I’m privileged in the sense that I did not grow up with any socio-economic barriers that would inhibit reaching my full potential in life. With that said, I can honestly say that I have lived through some difficult times in my life. I’ve been bullied, called names, shot at and punched. When I came home from the war that I was ordered to participate in, I came back to a broken system at the Department of Veterans Affairs, lost medical records, and long waits for benefits. Other Veterans have died while waiting for these benefits. I’ve yet to see rioting because of the deaths at the VA. In the past year or so, the media has been stoking the flames of the race war in America. I would never say that black Americans (as well as other minorities) do not live without being the victims of racism in some way, shape, or form. Racism is alive and well. It is not, however, the underlying issue in every arrest made by police. Are there bad cops out there? I’m sure there are. Are there people of every race and ethnicity out there committing crimes? I’m sure there are. We don’t know the details of the Freddie Gray case in Baltimore. The police chief stated that there were some improprieties during his arrest, but there is still an ongoing investigation. That fact seems to escape the rioters in Baltimore, who seem to think that racial injustice is cause for destroying public property and looting. Remember a few years ago when the Occupy Wall Street folks camped out in cities across the country to protest the “evil” (my word, not theirs) 1 percent that seems to control the wealth and banking system? How many people lost their homes, jobs, life savings, etc. to big banks that didn’t care about them? Too many to count. I’m not saying that I agree with the Occupy movement, but (for the most part) they were peaceful and just annoying to those of us that wanted to utilize the parks that they occupied. They did not cause millions of dollars of damage. Rioting is dumb and proves how little class you have. Martin Luther King, Jr. was able to effectively change the course of the civil rights movement through peaceful protest. I am pretty sure that the politicians in Washington, DC would not have taken Dr. King seriously if he had been advocating for equal rights through burning cars, looting, and assaulting police officers. If you think that there is some great injustice in your life, use your constitutionally protected first amendment rights and peacefully assemble. Write a letter to your elected representative. Encourage others to do the same things. Do not set fire to a business. Don’t set fire to a police car. You automatically lose the argument when you set a fire. The National Association for the Education of Young Children celebrates the “Week of the Young Child” each April. The staff at A Child’s World in Windham invited community members to visit their Center to introduce themselves to the children and share a story with them. We would like to thank the following community members for sharing their time with us! Dr. Kyle Rhoads Principal of the Windham Primary School, Chief Brent Libby from the Windham Fire Department, Kathleen Roope Child Care Specialist with the Department of Health and Human Services, Peter Godsoe Commercial Loan Officer at Norway Savings Bank, David Nadeau Chairperson of the Windham Town Council, Marge Govoni Chairperson of the Windham School Board, Jessilyn Rich from the Windham Independent Newspaper, Laurel Parker Children’s Librarian at the Windham Public Library, and DARE Officer Matt Cyr from the Windham Police Department. We truly thank you all for sharing your time with the children and supporting the work we do! We ended the month with an Earth Jams Concert with Matt Loosigian for the children and families at our center! A 9-year-old boy named Conner Vail does not just like the outdoors, he also loves writing stories. He also opened a new writing club at Windham Primary School in B house. He went through a lot of work to get this club going. He had a staff meeting with all the teachers and the principal. A lot of work, huh? The reason he opened this club after school is because Conner wanted to give kids a chance to express their feelings and write what they want as long as they are writing appropriate things. There are almost 80 kids in the writing club. Wow! Kennedy Kimball said that she joined because she likes to write. Abby Morneault said that she joined because she wanted to make cookbooks for her mom. So that is what is going on at WPS!